Recipe by: Breana Lai, M.P.H., R.D. 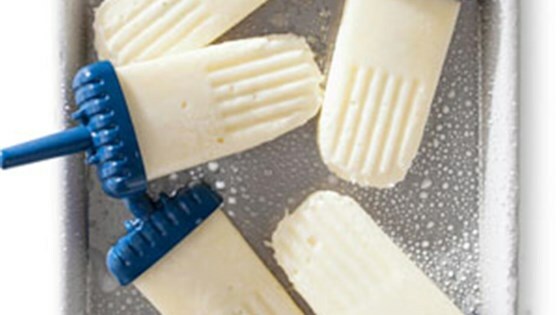 "In these coconut yogurt freezer pops, yogurt and coconut are blended together and frozen to make a cool, healthy snack or dessert." Combine yogurt, coconut flakes and coconut extract in a medium bowl. Divide among ten 3-ounce (or similar-size) freezer-pop molds. Insert sticks and freeze until solid, at least 6 hours. Dip the molds briefly in hot water before unmolding. These were ok. I added more coconut extract and a tbs of cream of coconut. Tasted like I froze a carton of yogurt. This recipe worked out great! I used Greek yogurt and I doubled the coconut extract. love these! Love these! I went against the recipe and used Greek yogurt, so good! Very creamy, perfect healthy "treat"
Like other reviewers I also used Greek just because it's so readily available. TIP: use the recipe and add almond extract as well to create a great "wedding cake" flavor.